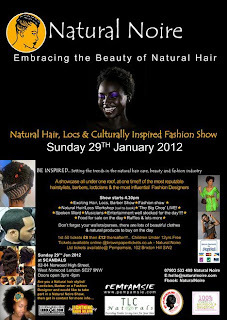 2012 has started with a series of natural hair (and locs) events. I am really loving the show of love, the increased number of events is a good indication of the growing demand for these workshops and it is heartwarming to see a growing hunger for 'things' that embrace our natural beauty - whether this be holistic health, natural hair events, or culture & fashion shows. 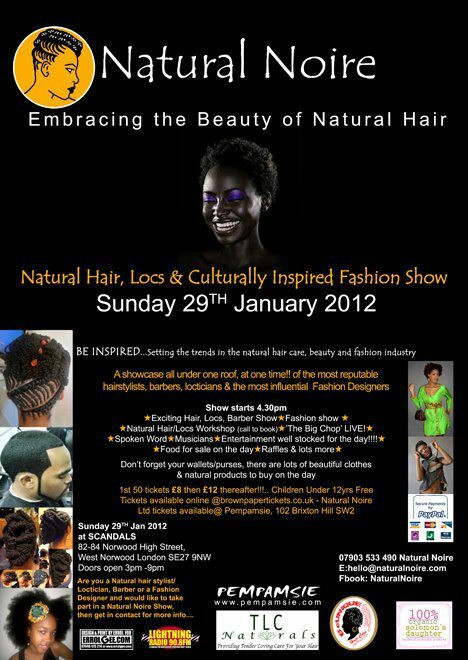 The Natural Noire (@naturalnoire on Twitter, Natural Noire on FB) event showcasing top natural hair stylists & barbers and inspiring cultural fashion will be held this Sunday 29th January. Sisterlocks consultants will also be in the house to answer your questions! I think my original post got lost in the wind somewhere, so I am reposting this in defiance. 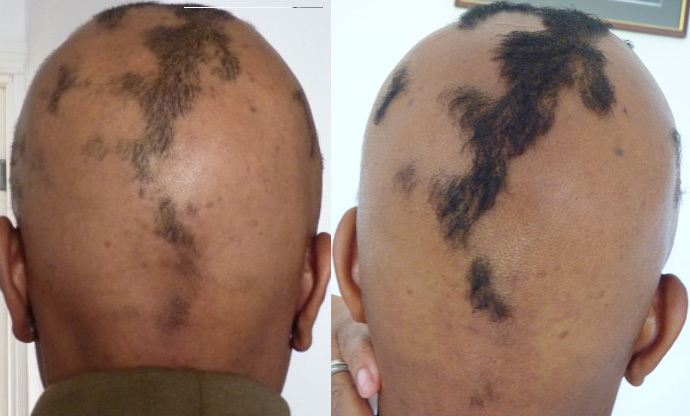 "Losing my hair was (is) painful. It is often embarrassing and very exposing. I have nothing to hide behind. I have to make sure my eyebrows are always done. I can't afford to have blemishes or a 'bad skin day' There are only so many scarves, head wraps and hats that one can wear... in the face of this (some may say trivial) adversity I AM STILL STANDING. I have good days and bad days, ups and downs. Days when I could care less (about the missing hair) and days I mourn for my Sisterlocks... even a TWA will do! But despite all of this - I AM STILL HERE." Thanks to those of you who continue reading and who continually send me messages of love and support. I haven't given up. I hope to see every hair restored.. til then.. I'll just keep doing me"
I am using my own blend of essential oils and additives, along with scalp massage and good old fashioned prayer :) Stay tuned. First of all - Happy New Year and apologies for my 'disappearance' :) The past couple of months have been filled with clients and you can imagine how busy it gets in the run up to the Christmas and New Year's eve celebrations! Today, I want to talk about shampoo bars. There is a lot of 'buzz' on the internet about them and I wanted to add my two cents in the hope of helping to clarify a few things. Last year - the following article appeared on CurlyNikki.com entitled: "The efficacy of shampoo bars"; generally speaking, the overall conclusion seemed to be that shampoo bars might not be so good, unless you religiously follow your routine with say - an ACV (apple cider vinegar) rinse in order to restore appropriate ph balance to your hair. I'd like to add to this... for one - the shampoo bars evaluated for the study were all cold processed soap bars. This is a shame because not all shampoo bars are cold processed soap. I will repeat that - not all shampoo bars are derivatives of soap. Therefore the 'issues' listed - such as soap scum residue or build up when used with hard water, and the high ph value of the product do not apply in a blanket manner to all types of bars. glycerin shampoo bars which combine hair loving oils and additives, humectants (namley the glycerin) and surfactants to create a lathery but solid shampoo. This product can be y clear, translucent or semi-opaque. 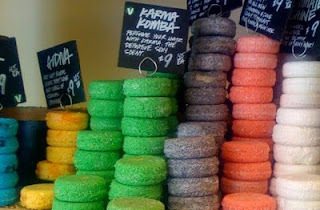 E.g Anita Grant Babassu Shampoo Bar range (which state they are already ph balanced). Solid Surfactant bars - these are created by blending combinations of 'dry' surfactants (noodles, pellets or pastilles) - usually the same ones you would find in a liquid shampoo - with oils and or butters to create a solid product. This product is usually opaque. eg. Almocado Clean* or Lush Solid Shampoo range. Since these products tend to use the same or similar recipes to the liquid shampoo versions minus the water and water soluble ingredients - the ph balance of the product tends to be much closer to that of the liquid shampoo (i.e. closer to 6.5 or 5.5 than the ph of 8 quoted by the afore mentioned article). This is why I say it is important to note that not all shampoo bars are cold processed and therefore the ph of the bars will vary - some cold process formulations will have included ACV or citric acid in the processing to help lower the pH of the end product. Some bars may leave residue in hard water areas and some will not. Some will need you to rinse with ACV after use and some will not. So - should you avoid shampoo bars? Not at all. The best way to evaluate any product is to try it for yourself. 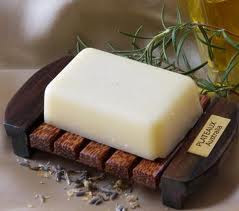 Just as some people have no issues with washing their bodies with soap and others prefer shower gels or creams - some people will have no issues with washing with a cold process soap bar- others will prefer a liquid shampoo or a glycerin or 'solid surfactant' based shampoo bar. There are plenty of options to choose from. Often handmade by homecrafters who love all things natural (and I'm all for supporting homecrafters and small businesses) Lye is a product used to help create the soap but no lye remains in the final product. Pros: usually chock full of natural oils and lovely stuff we like. SLS free. Can be superfatted (extra oils and butters to help condition your hair). Good lather. Can be filled with liquid herbal extracts. Cons: some brands can leave residue/build-up, an ACV rinse after shampooing is recommended. Also frequently handmade, using a combination of glycerin and mild surfactants (formulas will vary). Pros: tend to be milder than CP shampoo bars, the amounts of oils and oil based additives is limited (it won't stay hard if its too full of oil). Homecrafters will add as many natural goodies as they can. Normally SLS free (check the labels) and can be pH balanced. Cons: may not lather as much as CP shampoo bars; may not be as clarifying as other shampoos. A combination of solid surfactants (powders, pastilles, noodles) and anhydrous additives - including butters and oils. Can have very rich lathers depending on surfactants used. Ph can be regulated by through the use of citric acid etc. Fewer homecrafters tackle this one, but big companies (e.g. Lush cosmetics) will. Pros: Good lather, fewer ph worries, can be clarifying. Powdered extracts and clays can be added. Can be SLS free. Whatever you decide, I recommend that those of you with loose hair and mature locs use a conditioner after shampooing because of the benefits it imparts to your hair and its ability to help smooth raised cuticles and rebalance your hair's pH. (Conditioning immature locs can lead to excess slippage and softening which is detrimental to the early stages of the locking process). What are your experiences? Love em or hate em? I loved Anita Grant's peppermint & babassu bar for my Sisterlocks and I use All Clean on my daughters.